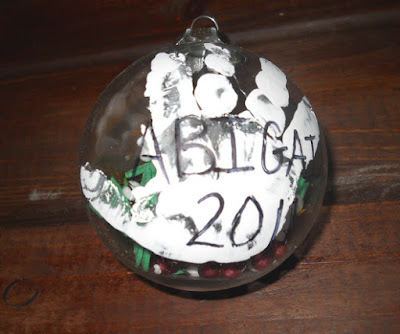 This ornament is one kids of all ages can create and make their own. I have 4 kids the oldest being 5 and the youngest 3 months. 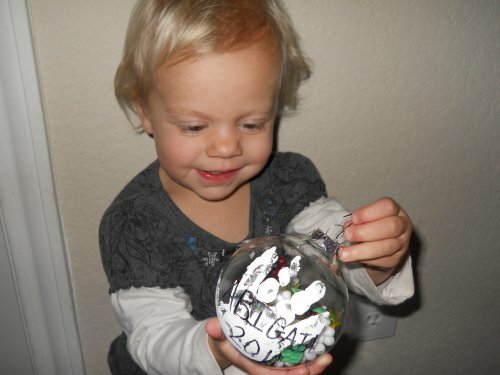 Our family tradition is to make ornaments each year. In years past I am normally the one to do the majority of the craft and they add little touches. This is the first ornament we have made that they were able to do all by themselves. 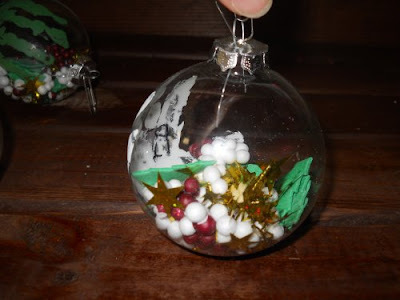 Not only is this ornament easy to make it is also very frugal. All items can be found at a local craft store and Dollar Tree. Handful of different items to place in the ball (Needs to be small enough to fit through the hole in the top and soft so it doesn’t break/chip the glass when your kids will inevitably shake it. I went to the Dollar Tree and browsed for items that would work. Copyright © 2011 by Jessica Dunham. All rights reserved.